Press Alt + F2, type gksudo gedit /etc/default/grub press Enter and enter your password. If you read the file that you are editing in the example above (/etc/default/grub), you will notice that the very first couple lines instruct you to run update-grub after making changes in order to update the actual file that grub reads to "get its instructions" (/boot/grub/grub.cfg). Note that you must actually run it with the sudocommand first as you need root privileges to actually run the command (which is why the poster above said to type sudo update-grub). This will cause the changes you made to be written to /boot/grub/grub.cfg. The very next couple lines tell you that you can read the full documentation of options in that file (again, /etc/default/grub) by typing info -f grub -n 'Simple configuration'. That said, set GRUB_TIMEOUT to -1 if you want to set the "grub time" to be indefinite. In other words, it will never automatically boot. You will have to make a selection. 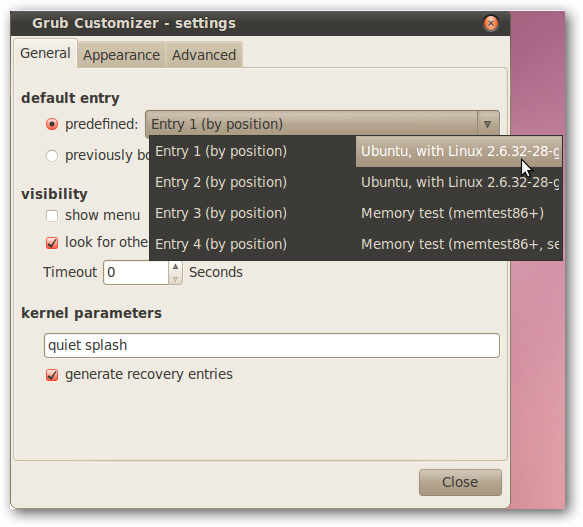 You can use an application called Grub Customizer. It is much more easier. 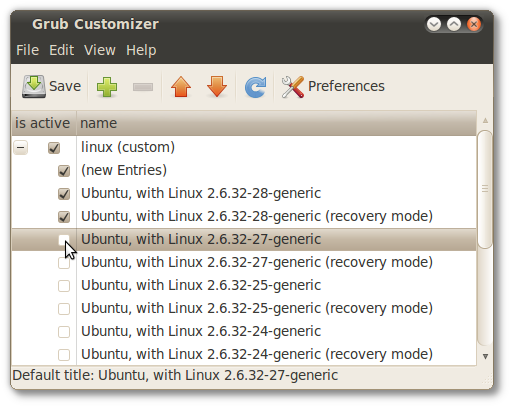 There is an How-To Geek article about it, How to Configure the Linux GRUB 2 Boot Menu the Easy Way. Also, there is a solved thread on the Ubuntu Forums, Change boot order in GRUB 2 that mentions this tool. I followed the first answer but it seems to need updating if you are dual booting with Windows 7 Pro and Ubuntu 16.04. Also make sure secure boot is off in the BIOS. a) First he says use Alt + F2 when I think he wants to use to open a terminal window. In my case it is Ctrl+Alt+T. sudo -i and press Enter and give your password and then Enter again. gedit /etc/default/grub and press Enter. c) You will now see the grub change menu as illustrated in answer 1. Follow his answer until he gets to Ctrl + S to save the changes. This doesn't work in Ubuntu 16.04 but you should see a save button in the upper right corner of the screen. Click on that. d) Ctrl + Q to quit. f) Type exit. You need to do this twice. I found that on my computer after a few logons the boot process would not show the grub screen at start up and therefore I could not get into Ubuntu as I had set Windows as my default bootup with a 7 second delay in case I wanted to get into Ubuntu. To correct this problem you need to get into Windows. Click on the start menu and type CMD in the search box. Right click on the CMD line which should be at the top of the screen produced by the right clicking. Finally, I rebooted back into windows. Using default entry based on a number astonished me since its introduction in GRUB. This is really bad idea. How about kernel update and automatic grub re-configuration? How about unaware users that prefer entry at the end of the list? Updates would break that default number based configuration. This doesn't work for me on 16.04, too. It can be done easily without any codes. Just follow these steps. 1. Open file system. 2. Open 'etc' folder. 3. Open 'default' folder. 4. 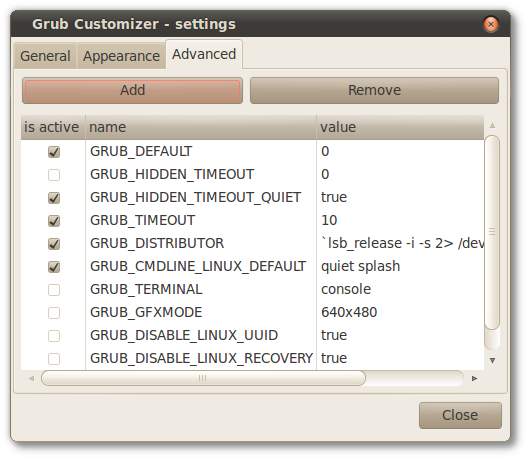 Find 'grub' file and open it with leafpad (or any other text editor). 5. Set GRUB_TIMEOUT to your need and save it. 6. Now open terminal and type 'update-grub'. 7. Rebbot your system. That's it. How to set windows 10 to boot first instead of Ubuntu? How to change grub timeout to zero? How to change the default OS in grub? How to open GNU GRUB with timeout 0 and default boot set to memtest?